"Bivens cost the tour $824,345 in salary, bonuses and benefits in 2008, up from $522,000 in 2007." "The interim commissioner, Marsha Evans, logged about 45,000 air miles to clean up after Bivens and salvage next season." Thanks to reader Rick for Karen Crouse's look at the hardship the new LPGA schedule inflicts on players down the money list, focusing on Reilly Rankin. The L.P.G.A. is a model of diversity and inclusion that has been at the forefront of globalization. And yet it is wobblier than it has been since its infancy in the early 1950s. In July, a player revolt led to the resignation of the commissioner, Carolyn Bivens, who had secured only nine contracts for 2010 events. The interim commissioner, Marsha Evans, logged about 45,000 air miles to clean up after Bivens and salvage next season. Michael Whan was named the eighth commissioner in the organization’s 59-year history in October and will officially take the reins in January. “I think that we should be commending Marty for making a difference in getting some relationships back on track,” Lorie Kane, a tour veteran, said of Evans. “What I’m most proud of in my career is that I’ve built brands; I’ve built them globally, and I’ve left them significantly larger than when I joined them"
Beth Ann Baldry files this profile of new LPGA Commish Mike Whan (family man, Midwest values, looks you in the eye, yada, yada, yada). You know, I've read four or five stories on the hockey stick dude and I still couldn't tell you the name of this glorious brand he built. See, Bivens Was A Visionary! 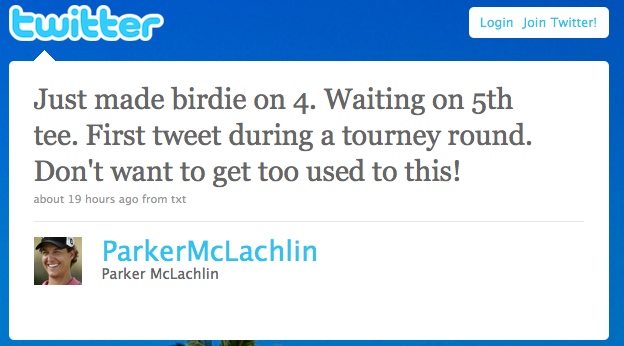 Granted, wrong tour, but look at the insights we could glean if players were allowed to Tweet mid round. As Stephanie Wei notes, the USGA says there's nothing in the rules that forbids the use of an electronic device during a round. However, I thought we decided this was a no-no since with Twitter or any phone that a player could receive advice? Alan Bastable tracks down The Donald and he has nothing but bad things to say about the Brand Lady. What's astonishing is that we know the ADT story Bastable shares from Donald is true, and yet she kept her job for another 8 months! "I can’t deal with that woman"
Beth Ann Baldry and Gene Yasuda talk to various folks tied to the LPGA Tour and get all sorts of interesting feedback about Carolyn Bivens. “What happened over the course of the last 10 days at the L.P.G.A. is cyclical"
"The two tours can even do co-ed events. Golf needs to think outside the box on things like this, find new ways to market itself." In 2005 she stepped down as CEO of the American Red Cross after a battle with the board of governors over what it called her "command-and-control" management style, according to the Washington Post. A search committee comprised of board members Leslie Gries, Juli Inkster, Helen Alfredsson and Bill Morton will work with the search firm Spencer Stuart to find a full-time replacement. Among the ideas being kicked around by some players is taking on a business partner with deep pockets to manage the LPGA, such as the PGA Tour. The two tours could coordinate schedules and have LPGA events end at 3 p.m. on Sunday, for example, before the PGA Tour television coverage begins. Or the LPGA could end on Saturday -- marketing it as Championship Saturday. "It's a no-brainer," one agent said. "The two tours can even do co-ed events. Golf needs to think outside the box on things like this, find new ways to market itself." It appointed Annika Sorenstam as advisor to the LPGA Board of Directors, and promoted Zayra Calderon, the tour’s senior vice president of worldwide sales, to executive vice president, tournament development and worldwide sales. Known as an engaging relationship-builder, Calderon will oversee all tournament business affairs and is charged with, arguably, the tour’s top priority: Working with tournament owners and title sponsors to secure renewals, and landing new business partners. - The LPGA sends out an announcement and then amends it to remind everyone that it is embargoed. The announcement release says that a 1 p.m. EST press conference will be held on the Golf Channel. But since it's embargoed, no one can write even a Tweet or blog post suggesting LPGA fans could tune in to The Golf Channel to find out what the event is about. - The LPGA allows no media (other than Golf Channel) present at this "announcement" to ask questions. We did have Christina Kim present and Annika Sorenstam on a phone line that died almost as soon as she started talking. - Carolyn Bivens is present at the announcement of her resignation and is shown on television, but she does not speak. Cynics will presume that her presence indicates she received a substantial buyout. And why will cynics presume this? - Marsha Evans is named the interim commissioner. A Bivens selected board member, Evans is a specialist in bouncing around boards and other executive jobs. She was on the Lehman Brothers board and we know how that turned out. She received a $780,000 buyout after resigning as head of the Red Cross just days before a likely humiliating Hurricane Katrina congressional hearing. - She's got a husband and he likes golf! Marty DeVine in an extensive profile detailing her career, her campaigning for McCain/Palin and other information, includes this: "Nonprofits have tapped her talents as well and she serves on the boards of the U.S. Naval Academy Foundation, which raises money to support education of midshipmen beyond what the federal budget provides, and the Ladies Professional Golf Association. An avid golfer, her husband Jerry particularly enjoys the LPGA board meetings in prime golfing sites." - The in-studio analysis job from Kelly Tilghman, Laura Baugh and Charlie Rymer with most of the conversation sounding like an LPGA infomercial and Baugh seeming to imply that the non-English speaking players were part of the Bivens downfall. Oy. - But hey, Bivens is gone and that's a start. But with all but one Board member not appointed during her tenure, it's hard to imagine this amounting to a sea change for the organization. Marsha: They want you as a new recruit! Anne Szeker reports that retired Navy rear admiral Marsha Evans has been named interim LPGA Commissioner after Carolyn Bivens officially resigned. Following up on the golf.com post, I just received an embargoed press release that does not actually contain details of the LPGA announcement, but instead, shares details of a forthcoming live televised press conference announcing the changes. Because the release was embargoed until 1 p.m. EST, I can't tell you the network name or the time. I'm sure the network in question will appreciate the LPGA's determination to make sure no one sees this press conference! "We're looking for someone for four, five months, three or four months, to just right the ship"
This unbylined AP story quoting Juli Inkster would seem to speak to the urgency of salvaging the 2010 schedule, something we speculated about here to explain the otherwise awful timing of the Bivens ouster. Inkster said it's important for the board to find the right person to lead the tour into the future. In the short term, the need is immediate. Inkster said the board plans on taking its time to find a new commissioner. "If these players today want to go back to being the red-headed step child, and getting kicked around by the PGA Tour, just getting the scraps, and not having a pension, then, yeah, buy out Carolyn." While Alan Bastable finds one candidate already throwing her visor into the mix (Jan Stephenson), I was looking around Craigslist's job ads for the C-level gig I've always deserved and after working through most of the southeast, finally caved and went through the Florida ads. You have to give the LPGA Tour points for already getting this ad up on Craigslist. For people who didn't want to overshadow the U.S. Open, they sure work fast! GolfDigest.com's Ron Sirak was first to break it, and Beth Ann Baldry at Golfweek.com wasn't too far behind. The Brand Lady is done. I'm shocked. Shocked that it took so long for this day to come. "The letter was a death sentence," one source within the LPGA told GolfDigest.com. "No confidence by the players is a dagger in her heart," said a second source, this one involved in tournament ownership. Bivens has 18 months left on the three-year contract extension she signed at the beginning of 2008. Her salary, according to LPGA tax filings, is $500,000 a year. According to a source in tournament management, a general agreement with Bivens on financial terms was reached late Wednesday. The only remaining questions surround when Bivens leaves office and how her departure is framed. "She's gone. It's just a question of whether it's a firing or a resignation," said one veteran player, a Bivens supporter. "And she doesn't deserve any of it." "As we've said throughout the week, we want all of those interested in women's professional golf to focus on the play here at the U.S. Women's Open, which has started today and will conclude this weekend when the 2009 champion is crowned. Out of respect to the USGA and the amazing work that they've done and continue to do in producing and hosting this great event, we will not respond to media reports on internal matters related to the LPGA business. The LPGA players, staff and Board care deeply about our Tour, and we're all working hard to achieve the same long-term objective to grow our Tour. We look forward to a great week of golf." Just as she received a vote of confidence from two Hall of Famers as Garry Smits reports, Sports Business Daily says that buyout talks have begun and a headhunter is already making calls to potential LPGA Commissioner replacements. Here's an AP summary of the SBD story for those who are not subscribers. "We’re not sure whether she crushes the grapes with her feet or wedges, or melts them out of their skins with her icy stares." Before we get to that gem, Jim Achenbach is tired of the Brand Lady resignation talk. Maybe the wisest move she's made in a while. "Somewhere along the way, we have lost the relationship that is essential between sponsors and the LPGA." Not a lot of positive coverage for the Brand Lady, and the theme is pretty consistent: sponsor relations stink.